As one of the biggest reasons for artificial grass’ incredible popularity in recent years, pets are a tremendously important consideration for any homeowner looking to transform their garden or make a change in the home where an artificial lawn might come in handy. It’s something we’ve noticed, too, as most of the customers we happily serve here at Great Grass are pet owners themselves wondering about the compatibility of our product with their furry friends. If you were similarly interested in making an investment, but you weren’t sure how your pets would react to the sudden change, have no fear! We’re more than able to shed some light on the issue, just as we’re approaching that time of year where summer is poised to shine light on your garden. Our artificial grass products are pretty much universally designed with pets in mind, as we’re big lovers of owning animals ourselves! Whether you’ve got an active dog that loves nothing more than to run around madly when the sun’s out, or a cat that takes the time to chill out on the lawn in the summer, the authenticity and remarkable softness of our grass is sure to win over any animal companion. It should be immediately obvious why so many pet owners make us their first choice for a supplier of fantastic artificial grass, especially when you consider that our lawns are perfect for anyone looking to get their hands on a gorgeously lush surface that’ll stay pristine and perfect all year round no matter what. Make sure you don’t miss out on your very own maintenance free, pet perfect artificial grass lawn today! So what’s stopping you from making the switch to a Great Grass artificial grass lawn if you’re a pet owner interested in getting your hands on a garden that they’re sure to fall in love with? 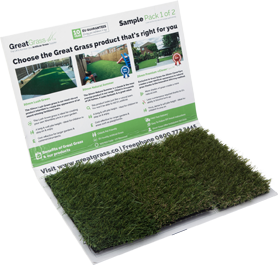 All it takes is a simple online enquiry or phone call via the details on our contact page if you’d like to chat about our artificial grass or receive your very own sample pack today!